#71 Ladybird Pupa, originally uploaded by See Fei. This is the insect world version of the ugly duckling. 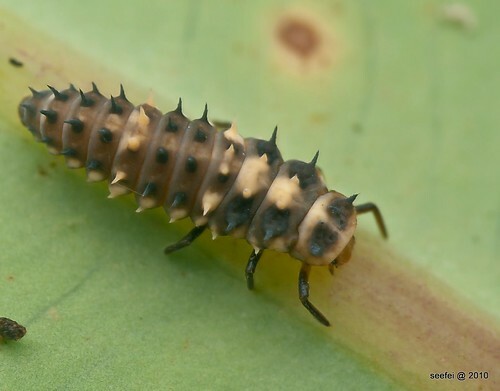 The cute ladybird beetle started life as a fierce centipede look-alike creature. In the human world, the closest equivalent i ever observed is my nephew. He used to be a naughty and spoilt brat in his younger days but after going through army and NUS, is now a soft spoken gentleman. So, we are not what we used to be. We change. From bad to good. Or good to bad. We will never know what we will become. Be mindful and aware and hopefully we will not be too far away from the middle path. #79B “Bring ME to your leader!”, originally uploaded by See Fei. A grasshopper that look evil and fit perfectly into a invading martian in sci-fi movie. Except this quiet and non-assuming creature is a peaceful garden dwellers that was found in the serene Bukit Batok Nature Park. 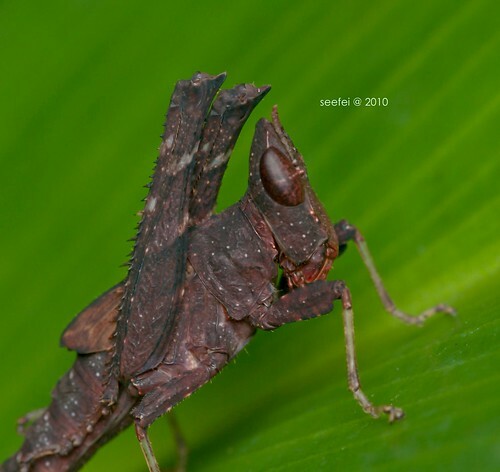 Besides the fierce alien look, this grasshopper is unique in the orientation of its hind “jumping” legs. They seems to “lean” forward and in a very unnatural position. I am still trying to find out the ID of this grasshopper. The first one i met was at Mandai Orchid Park a couple of months ago. Hope the next time we meet i will get to shoot the front shoot showing those big compound eyes. #54 Two is Company, originally uploaded by See Fei. Ants tending to their herd of aphids. The aphids are sap sucking animals which the ants kept for their sugar supply. Sap is rich in sugar which the aphids take and excess will be excreted. 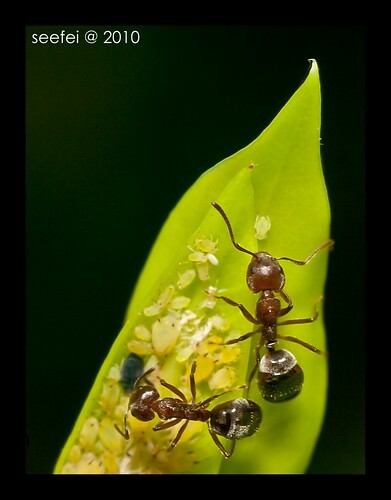 The aphids are treasured by the ants for their sugar-rich excrement.